This paper tries to find an answer to the question of how to finance the Sustainable Development Goals (SDGs) that the world has just decided to implement. I argue that besides the existing wealth of proposals, mainly along the lines of better governance and co-financing strategies, we need a complementary approach: parallel Quantitative Easing (QE) for SDGs only. Reverse pricing effects, drying out shadow economies and the impact of such a QE-SDG on the current liquidity trap and the debt trap are explained. In September 2015, the world agreed upon a map for mankind’s future up to 2030. The Sustainable Development Goals (SDGs) formulated in this map with 17 targets will replace the Millennium Goals. * This consensus was reached through the UN’s largest consultation and review process in history. Hundreds of surveys, expert groups, panels and hearings took place, and millions of citizens were engaged in population-based questionnaires contributing to this agenda. With the SDGs, the world has provided itself with a map charting its course for the next few years with the aim of living in a more just, more sustainable, more wealthy and more stable world. However, this commitment does not come cheap. For example, an additional 30 billion USD annually is required to finance the climate pathway over the next 15 years.† The transition towards a more cyclical economy would cost Europe some 100 billion USD over the same period. The overall costs of the SDGs are estimated at around 4-5 trillion USD per year in public spending, investments and direct aid. According to the United Nations Conference on Trade and Development (UNCTAD), there is an annual investment gap of at least 2.5 to 4 trillion USD.‡ Despite this global UN consensus, there is less clarity on how to finance this agenda towards greater “dignity, prosperity, justice, partnership, planet and people” (Ban Ki-moon 2015). However, if we fail to discuss where the money will come from, the SDGs are basically dead at birth. In short: where will the money come from to make this huge global shift? "What is required is additional liquidity at a high scale, at full speed, and soundly targeted towards SDGs in a smart way that is different from what has been done in the past." Conventional strategies for financing the SDGs consist of a host of proposals, including regulatory agendas (offshore and off-sheet), different taxation schemes (progressive income tax; inheritance tax; financial stability contribution), and co-financing protocols (e.g. Global Marshall Plan Initiative), all designed to improve global governance.‡‡ None of the proposals is wrong. Yet, despite the intellectual scrutiny and practical heterogeneity, they all have one aspect in common: they all imply that the required liquidity will be created through the standard protocol of Quantitative Easing (QE) stewarded by central banks (CBs), where the commercial banking system eventually creates 95% of the credits loaned to the real econ­omy.§§ Meaning, all the proposals consider a monetary monoculture to solve real problems. If we consider the most optimistic scenario in which the world is growing at the rate of 2% per annum over the next few years and we dedicate 1% of world GDP to SDGs, we end up with roughly 750 billion USD a year.¶¶ Following the UN statement, financing the SDGs however require an investment and aid strategy almost 6 to 8 times higher and we have to achieve these goals much faster than assumed. *** Apparently, the conventional approach is one scale too small and one gear too low. However, withdrawing 6-7% (4-5 trillion USD) of world GDP (70 trillion USD) every year—even if done in a smooth and subtle way—from the market economy and steering it towards the SDGs would create the largest economic recession the world has seen in modern times. We have to think of a different mechanism, both in terms of scale and speed. Clearly we are not only running out of time, we are also running out of capital to finance our common future. What is required is additional liquidity at a high scale, at full speed, and soundly targeted towards SDGs in a smart way that is different from what has been done in the past. QESDG is 100% electronic. There will be no cash available. This makes it trackable and recordable and limits access to the shadow economy for money laundering and tax fraud. Governments decide to accept this form of liquidity to pay taxes. The QESDG is bounded: in contrast to the QECON mechanism, the purpose of the QECOM is investments in SDGs only. This restriction of the investment portfolio avoids the liquidity trap. Bounded liquidity is injected into the real economy directly and consequently steers society towards greater sustainability. A “banned list” guarantees that the money is only spent on issues that are healthy, fair and sustainable. While it is difficult to identify a list of positives, it is much easier to come to a consensus on a negative list. This would, for example, exclude drugs, guns, prostitution, human trafficking and so on from expenditure. The QESDG has a limited convertibility with the conventional money system of, for example, a 10-15% exchange rate. This will encourage clients, companies and states to reinvest into the SDGs or to convert money with a loss. "We are psychologically trapped by the idea that there can be just one monetary system, providing a single, specific form of liquidity for all purposes, pretending that the power of allocative distribution is most efficient." 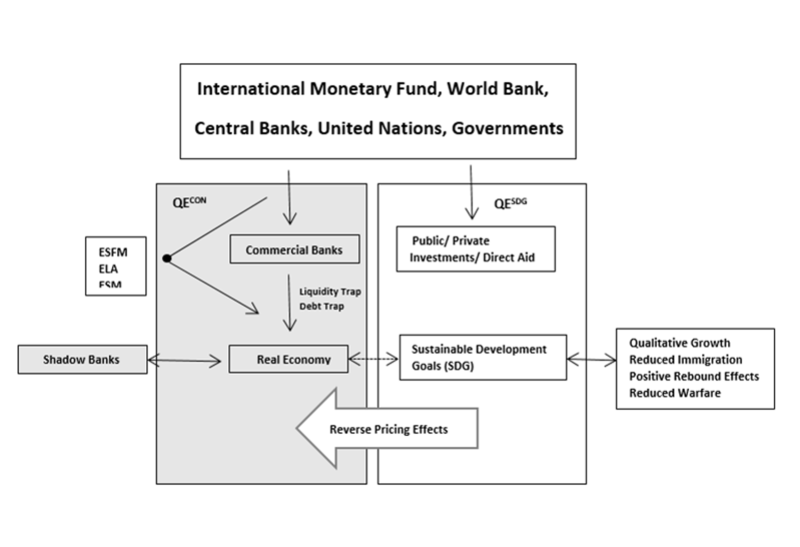 Ending the liquidity trap: In a globally deflationary situation of 4-5 trillion USD, a QESDG offers additional liquidity in an intelligent design. Instead of providing liquidity through the standard protocol, which failed to provide credits to the private sector, bounded direct investments†††† in green and social projects (including a demurrage fee) can ensure that the liquidity hits the real market. Reducing the debt trap: Most countries are overindebted with little or no leverage funding additional ecological or social projects. The additional liquidity ensuing from QESDG will trigger green and social investments most countries are short of. Drying out shadow-economy activities: There is less need for people to make an income through drugs, crime, and human trafficking. Regional wars on resources and forced immigration will be reduced and employment in the ‘green sector’ would reduce attractiveness of unemployed youth joining terrorist movements. There are indeed two further challenges. First, additional bounded liquidity will reduce the efficiency of any economic transaction, as there are two pathways for processing economic activities instead of one. Systems theory has shown, however, that forms of parallel processing will render systems more resilient, shock-proof, greener, safer, fairer and richer, despite the loss of efficiency.2 This is known in engineering (power grid), air plane safety measures, agriculture (monocultures versus higher diversity) as well as in the human immune system. This is true for the monetary system, too. In short: there is a net gain to be derived from a parallel system to stabilize the overall system. Taking into account the number of debt (186), state banking (96) and currency crises (180) since 1975,3 a parallel currency system would make our world more resilient. Second, we have the hazard of inflation, and indeed, a 4-5 trillion USD additional stimulus will create an inflationary pressure on price levels. However, any dollar spent through this “green” mechanism will reduce costs in the conventional economy in the so-called entropic sector.§§§§ This “reverse pricing” effect will reduce the price level in sectors nobody really wants: crime, forced immigration, human trafficking, ecological disaster management, unemployment, poverty are just some examples, as human activities are getting invested in a greener and more socially just world. If we start looking at the world from an SDG perspective, we can see that it is vastly deflationary, meaning there is by far not enough available liquidity to finance these unmet needs. In numbers, about 4-5 trillion USD is lacking every year to make the world a better place. However, the conventional way of creating that liquidity is restricted due to the liquidity trap and the debt trap, providing little to no future additional leverage. An additional but different design of liquidity is required, running in parallel to cope with the SDGs. The advantage of a QESDG is that it would work on different scales: locally or regionally as well as globally. The stimulus thus created could be adjusted and scaled up according to the investment plan and unmet needs. We could start with local and regional projects identified as SDGs and scale up. With a QESDG, we can begin to rethink the relationship between society and the money system. Money will eventually serve people and not the other way round. F. Schneider and C. Williams, The Shadow Economy (London: Institute of Economic Affairs, 2013). Bernard Lietaer, Christian Arnsperger, Sally Goerner & Stefan Brunnhuber, Money and Sustainability: The Missing Link. A Report from the Club of Rome – EU Chapter (Triarchy Press, 2012). Hans Werner Sinn, The Euro Trap. On Bursting Bubbles, Budgets, and Beliefs (Oxford University Press, 2014). Anthony Atkinson (2015), Inequality, What can be done, Harvard University Press. IMF (2012) Jaromir Benes and Michael Kumhof The Chicago Plan Revisited (IMF Working paper 12/202 (August 2012). Kennedy, Margrit & Lietaer Bernard, A. (2005): Regionalwährungen. Neue Wege zu nachhaltigstem Wohlstand. München: Riemann. Kjell Hausken, Mthuli Ncube, Quantitative Easing and Its Impact in the US, Japan, the UK and Europe, Springer Science & Business Media, 2013. Summers, Larry. (2013): Rede an der IMF fourteenth annual research conference in honor of Stanley Fischer. Stiglitz, Joseph E. (2012): The Price of Inequality: How Today’s Divided Society Endangers Our Future. New York City: W. W. Norton. Werner, Richard A. (2012): How to end the European crisis—at no further cost and without the need for political changes. Southampton, GB, University of Southampton, 12pp. (Centre for Banking, Finance and Sustainable Development Policy Discussion Paper, 2-12). ††† If governments are allowed to issue these “notes”, the design would be similar to that of the Chicago Plan (see IMF 2012). It is important to understand that the only real power and leverage that governments have in the monetary domain is the capacity to specify the kind of currency or currencies they accept in payment of fees and taxes. ‡‡‡ This amount of money reflects roughly the M0 quantity that central banks are issuing worldwide in order to stimulate the conventional economic sector. The same amount of liquidity, within the different design described above, is necessary to provide sustainable wealth for 80% of the world population. §§§ Werner, Richard A. (2012): How to end the European crisis—at no further cost and without the need for political changes. Southampton, GB, University of Southampton, 12pp. (Centre for Banking, Finance and Sustainable Development Policy Discussion Paper, 2-12). ¶¶¶ However, a negative interest rate has two impacts: first, it can encourage inefficient and hazardous investments that would have never been made under a positive interest rate. Second, it can stimulate long-term socioeconomic investments. The question is: bad or long term? Taking a design in which the QECON has a long-lasting perspective and is targeted towards SDGs, any investment in this field will do good or better, even if efficiency is partly reduced. †††† With the Emergency Liquidity Assistance (ELA)-Mechanism, the ECB has several years‘ experience in injecting additional liquidity into the market (https://www.ecb.europa.eu/press/pr/date/2015/html/pr150628.en.html). ECB would indeed become, in collaboration with UN, IMF and WB a green investment bank. ‡‡‡‡ A positive “rebound effect” will accelerate the SDGs, moving the world in the right direction.